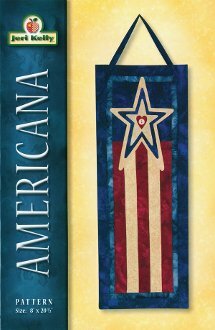 Striking patriotic banner, suitable for hanging on a wall, door, porch or flying in the breeze. It's a breeze to make too - choose from your stash. Wall hanging measures 8” x 20 1/2” and the pattern includes instructions, diagrams and full-size applique pattern. Americana decor at it's best!